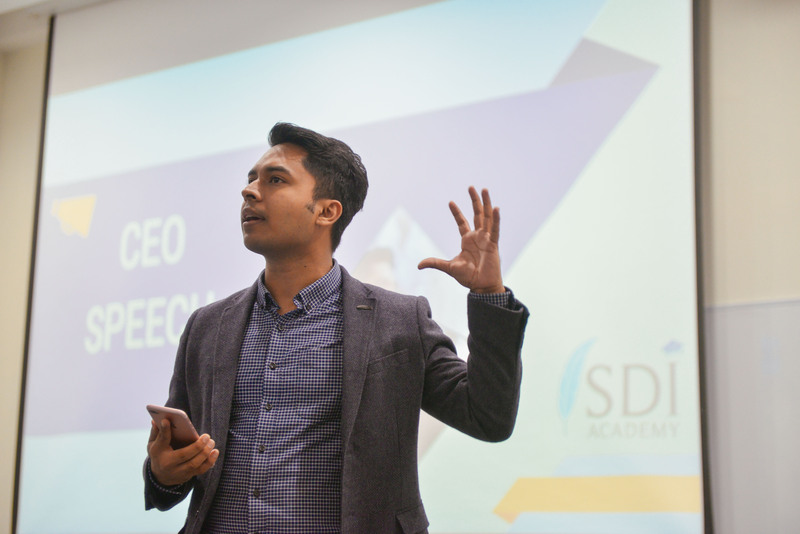 Sazzad Hossain, seen here giving a speech during a Social Development Initiative (SDI) Academy graduation ceremony, is the only Singaporean selected by the Ashoka Fellowship in 2018. Like most students in NTU, Sazzad Hossain spends his week attending lectures and hunched over his laptop. But apart from being a second-year School of Electrical and Electronic Engineering (EEE) student, Sazzad has also been the chief executive officer of Social Development Initiative (SDI) Academy – a school which aims to empower migrant workers through language, vocational and computer skills classes – for six years. And in November last year, the 25-year-old earned an additional feather to his cap when he became the youngest Singaporean to join the Ashoka Fellowship, a prestigious international programme that connects some of the world’s leading social entrepreneurs. Nominations for the Ashoka Fellowship are open to the public and nominees go through a rigorous selection process. According to Ashoka, nominees for the Fellowship must show they are committed to promoting systemic change around a problem they identify in the world. Nominees are then evaluated on the novelty, creativity and social impact of their solution to this problem, among other criteria. To date, there have been over 3,300 Ashoka Fellows from 92 countries since the programme started in 1981. In 2017, only 2 Singaporeans were elected as Fellows – Zhihan Lee, as the CEO and co-founder of BagoSphere, a social enterprise that seeks to equip rural youth in the Philippines with in-demand professional skills, and Bjorn Low, as the co-founder of Edible Garden City, a social enterprise that champions the grow-your-own-food movement around the world. “I have seen the calibre of the people (in the Fellowship). Knowing that such people are part of the network, I felt that it was an honour even to be nominated,” Sazzad said. According to Mr Rajesh, Sazzad’s age was not a concern for Ashoka during the Fellowship selection process. “Ashoka does not worry about age,” said Mr Rajesh. “We have Ashoka Fellows in other countries, who had been elected as young as 24 years old and as old as 65 or 70 years old. “They always find solutions to solve problems. This is the attribute that matters,” he added. 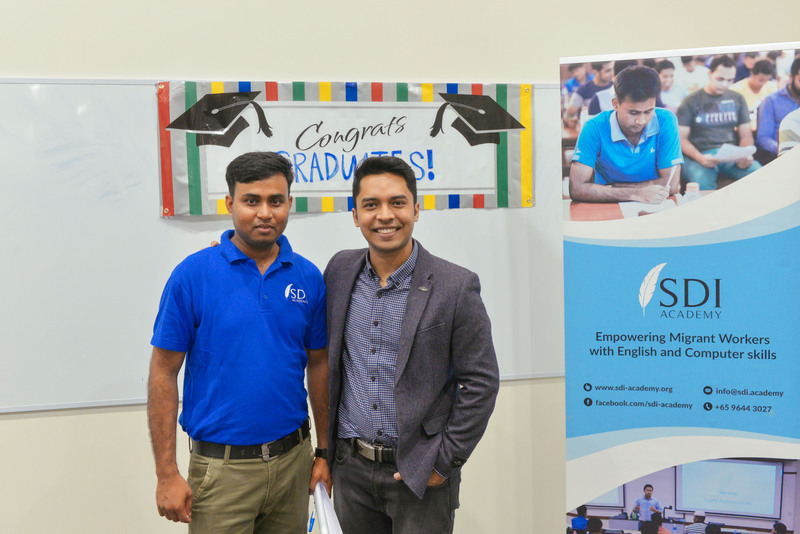 Sazzad (right) with a student of the SDI academy at their graduation ceremony. Even though SDI Academy has trained about 7,000 migrant workers to date, Sazzad is only getting started. He intends to train another 5,000 workers this year, while looking to collaborate with national agencies such as the Ministry of Manpower and Workplace Safety and Health Council. With this Fellowship, Sazzad hopes for future partnerships with his newfound network of social entrepreneurs, bringing SDI Academy to the international scene. “Ashoka is a lot about collaborating with people from different countries, but with the same thought process and mindset,” he said. There are already plans in place to go beyond Singapore. He is hoping to expand his work to Dubai and promote social inclusion there this March. Workshops on leadership, personal well-being, impact and investment upscaling are also offerings within the Ashoka Fellowship. Sazzad believes he now has the support to reach his goals by being part of the Fellowship. “If we see a gap in the community, Ashoka has the credibility, network and capacity to push the larger body out there for a policy change,” said Sazzad.